This story is the first in a series profiling faculty who are bringing innovative strategies to their classrooms. Each month, we will explore the approaches, interventions and teaching philosophy of a different educator at IU Southeast. The series is part of an initiative launched by the Institute for Learning and Teaching Excellence (ILTE) to bring attention to the efforts of instructors to increase student learning, and to share best practices across the campus. Each year ILTE accepts recommendations and self-nominations from faculty and adjunct faculty, and after a review selects eight finalists for a special commendation. At the end of the year, one of the innovators will be recognized with the ILTE Faculty Innovation Award for Teaching and Learning. The award will be announced at a luncheon for all of the faculty innovators in April, 2018 and recognized at the Fall Faculty meeting. (NEW ALBANY, Ind. )—Summertime: pitching tents, cooking smores, and telling stories around a campfire. Then the overhead lights come on. The imaginary National Park dissolves, and the world of desks and whiteboards returns. The campers are not in Yosemite, the Everglades or Yellowstone, they’re in a classroom at Parkwood Elementary School in Clarksville, Ind. The traditional school blends into a now-fragmented landscape of established residential neighborhoods, big-box malls, car dealerships and apartment complexes. It serves a community in transition, and reflects that transition in its social and ethnic diversity. For the past six summers, education students in IU Southeast’s graduate and transition to teaching (T2T) programs have spent two weeks here as part of the Summer Academy, teaching language arts and math to recent immigrants, K-4, whose native tongue is not English. This is service learning at its finest, a well thought-out integration of community needs and curricular goals that benefits both partners and delivers tangible social and academic rewards in the form of elementary school students who progress and teacher candidates who gain real-world experience. Every year, the Academy has a different theme. Two summers ago, it was outer space. This summer, it was National Parks. If it doesn’t sound like language arts, that’s all part of the plan. 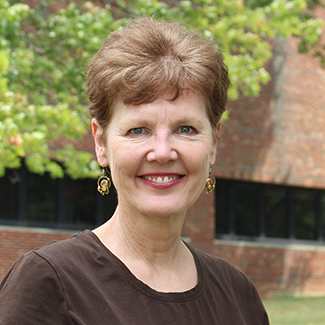 Susan Ridout, professor of education, is the mastermind of the Summer Academy, an experiment that brings to life her approach to teaching and learning. She has been joined for the past four years by co-director Debi Mink, associate professor of education, in crafting a program that, while brief in duration, is lasting in impact. Love. Joy. These are the deceptively non-meta terms that frame Ridout’s sophisticated vision. Thanks to that vision, something important is happening here. You can sense it. The children, who might have seen summer school as a dreary obligation, if not a ritual of penitence, are excited to learn amid a playful atmosphere that features cool subject matter and surprising activities as the proverbial spoonful of sugar to help the grammar go down. The mixture of graduate and T2T students, which could have been a train wreck, in fact yields a purposeful and productive synergy as expertise is exchanged and knowledge gained. The magic ingredient is joy, an emotion that figures so prominently in Ridout’s thinking, teaching and living. The Parkwood Summer Academy was launched in response to a request from a teacher who wanted to help her students hang on to their learning gains over the summer vacation. With its burgeoning population of largely Hispanic immigrants, Parkwood had already become a remote site for the New Neighbors program. In response to the request, a School of Education delegation visited the school and subsequently developed plan to create a summer laboratory for graduate education around language arts. Ridout took the lead and the Summer Academy was born. There was no blueprint, no model to base it on, no pedagogical formula to replicate. Just the courage to do something new, and the sense of urgency to do it now. That urgency was borne out of Ridout’s philosophy of teaching is an act of transformation, not just for students, but for teachers as well. Instead of imposing a theoretical structure onto the messy realities of the classroom, she embraces the swirl as an opportunity for personal and professional growth. Raised by educators and committing early to the life of a teacher herself, Ridout distinguished herself at Murray State University as a scholar and in the fourth and seventh grade classrooms of Southwest Elementary School in Murray, Ky. as an educator. When she chose to attend graduate school at IU Bloomington, her superintendent held her teaching post open, hoping she would return. Upon graduation, she received an offer from IU Southeast. She had a decision to make, and ultimately saw a greater impact for herself in teacher education. At IU Southeast, she has been a leading member of a generation of scholar-educators that has transitioned the program from blackboards to laptops, and from mono- to multi-cultural classrooms. She was part of the team that wrote the current mission and vision statements of the School of Education. Not surprisingly, its four principles are guiding lights in her own philosophy: professionalism, caring, leadership, diversity. “As a professor, I measure my success by my attention to these four goals,” Ridout said. Recognition for her efforts has come in the form of a Distinguished Teaching Award, two Trustees Teaching Awards, a Master Teacher Award, alongside external awards such as a Metroversity Outstanding Faculty for Adults Award and one of ten Outstanding Young Women of America Awards, among many others. Navigating constant change in her field, local demographics, job markets, and other areas, Ridout trusts in her own compass, and in a core of basic principles. And of course it’s all deceptively simple. “Good teaching is good teaching,” Ridout said. Teaching is not just another career. In Ridout’s view, it means committing to a life of constant transformation. Contrary to the perception that teachers have an easier gig and summers off, the reality is that teachers work harder than just about anyone else. Year round. Their “product” isn’t shoes or microchips or burgers, but something more intangible yet more powerful: minds inspired and trained to learn. To get there takes a tricky combination of academic expertise and empathy. Parkwood is a good example of the knowledge base at work. Basically you have to know what you are doing, as an instructor. Ridout herself pays tribute to intellectual forbears such as Lev Vygotsky and Malcolm Knowles, constructivism and sociolinguistics. But she is really an academic omnivore who is simply always learning what she can, from whatever reputable source she might be able to find, while staying alert to manifestations of ingenuity that might present themselves serendipitously. “In order to be effective teachers, students must have a love of learning and a belief that teachers continue to develop throughout their careers,” Ridout said. As good as all that knowledge is, Ridout considers it sterile unless it works in the real world of the classroom. And not the ideal classroom, but the actual classroom that a particular teacher candidate has to deal with. This is where empathy comes in. “My work is about getting teachers to understand that they have to have knowledge, and then they have to apply that knowledge with the notion that we’re not working with robots, we’re not working on an assembly line, we’re working with kids who come with different issues, from different home backgrounds, with different things on their minds, maybe carrying around something that just happened on the bus,” Ridout said. Teaching is not really ready-to-wear, in other words, it’s bespoke, or it’s missing the point. The synthesis comes while dealing with individual children. When confronted with unique combinations of personality and background, teachers must first have the courage and patience to get to know their students. Ridout uses the example of comprehension to illustrate her point. When the teacher fully understands the student’s issues and needs, the knowledge base comes into play, to identify and structure curriculum and tactics to engage the student and help her or him discover the joy of learning. In the Parkwood Summer Academy, a good deal of time is allotted for reflection. In fact, in all of Ridout’s courses, reflection, and the sharing of reflections with other students and with Ridout herself, is essential. She doesn’t see children as robots, and she doesn’t want teacher candidates to be robots either. She wants the students to build a circle in which reflection leads to self-awareness, which in turn feeds intentionality in the classroom, and circles back to reflection. Assessment is more than just grading. It’s a process of coaxing the teacher candidate to a deeper level of reflection and awareness. In Ridout’s universe, teachers and students really are on a learning journey together, the teacher’s path mimics that of the student’s. The goal of the independent learner–the participant in the learned society, as Ridout puts it–knows no age difference. It seems almost profane to see all this higher consciousness as a mere classroom tactic, but in a sense it is, for in its own way, the desire to reach a higher plane of insight does provide the motivation necessary to address the wave of mundane needs that wash up against a teacher each and every day. “We have to make sure our teachers have the right philosophy of why they are here, and what they are doing,” Ridout said. Innovation plays much the same roles, simultaneously cause, effect and purpose. In the context of elementary education, innovation is more than a way to spice up the routine, for Ridout it’s a basic survival art. Let’s face it, burnout is a fact of life in education. A large percentage of new teachers leave the profession after only two years. Much of that can be chalked up to poor preparation based on unrealistic expectations, in Ridout’s view. Less stress, more money, smaller classes, fewer tests – there are a lot of suggestions for making a teacher’s life easier on a day-to-day level, and hopefully more attractive to prospective entrants. That’s good work if you can get it, as the song goes. The emerging reality is more sobering, and tends to reinforce the traditional image of teachers as those who gladly go above and beyond, making personal sacrifices for their students, buying school supplies and working weekends. It turns out that for instructors like Ridout, the secret to longevity in the craft of teaching is less obvious than more money and more vacation, yet it’s more fundamental. It comes from being able to see this career as a process of personal growth and giving, driven by the gumption to innovate–relentlessly and fearlessly. That insight has paid off for Ridout, as innovation has fed a process that has renewed her sense of purpose and enjoyment. Besides Parkwood, she has also worked on other projects that pushed her outside her own comfort zone. At Galena Elementary School in Floyds Knobs, Ind. from 1989 to 2010, she led teams of teacher candidates that integrated emerging technologies into the curriculum. At Farnsley Middle School in Louisville, Ky. from 2001 to 2010, her candidates became writing mentors for lower-income middle school students, and held writing conferences in person and using video-conferencing technology. It’s a simple calculation really. Children are dynamic. A teacher’s role is to nurture and channel that dynamism. So to become static in one’s approach is to lose touch with the teacher’s basic mission. Back at Parkwood, Ridout is in her element. There are discussions with graduate students about assessment tools and reading inventories that will help determine a child’s zone of proximal development, and there is also the raucous mixture of games and activities and singing and videos and finger-painting that function as the applied side of all that specialized knowledge. Ridout is constantly in the schools, 18 to 20 of them per year, assessing the effectiveness of IU Southeast graduate students. They need to show her that they are successfully applying reading and writing strategies, as well as knowledge in subject-matter areas like science and social studies. They need to demonstrate the integration of music, poetry, hands-on learning, technology, and more. This is the best of both worlds for a scholar-educator who never abandoned her love for teaching children. “I have this incredible opportunity to influence our IU Southeast students, who in turn have an impact on children for years to come,” Ridout said.